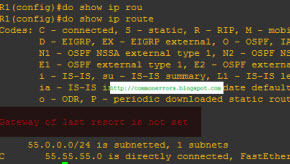 You may notice the Line “gateway of last resort is not set” in output when you use the cisco command Show IP Route. This short article will explain that why you are getting this message. Routing table have the list of all known routes. Every time when a router receives a packet, router matches it with routing table entries if it present in routing table then it forward to that path and if route not present in routing table then it is forwarded to default gateway or default route. Instead of ip default-gateway command, you can use ip default-network when ip routing is enabled on Cisco-router. When you configure ip default-network the router considers routes to that network for installation as the gateway of last resort on the router. Gateways of last resort selected using the ip default-network command are advertised differently depending on which routing protocol is advertise the default route. For IGRP/EIGRP to propagate the route, the network specified by the ip default-network command must be known to IGRP or EIGRP. RIP advertises a route to 0.0.0.0 if a gateway of last resort is selected using the ip default-network command. The default route advertised with the ip default-network command is not propagated by IS-IS and OSPF. Creating a static-route to unknown network is another way to set the gateway of last resort on a router. IGRP does not recognize a route advertise with static route command to 0.0.0.0. You are required to use the ip default-network command in case of IGRP. EIGRP advertise a route to network 0.0.0.0, but the static route must beredistributed into the routing protocol. RIP routers running Cisco IOS 12.0T and later does not advertise the default route where as in earlier version it automatically create a default route 0.0.0.0. 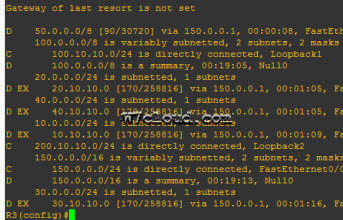 Use the ip default-gateway command if the ip routing is disabled on Cisco-router and Use the ip default-network and ip route 0.0.0.0 0.0.0.0 commands to set the gateway of last resort on Cisco routers that have ip routing enabled. The way in which routing-protocols advertise the default route differs for each protocol. In an inter-network environment, normally you have a single routing-protocol for ease of controlling your network. But when you are connecting the multiple networks, branch office with each other then there may be the different routing protocol. Route Redistribution permits routes from one routing-protocol to be advertised in-to another routing-protocol. The routing protocol which receives these redistributed-routes are normally marked the routes as external-routes. External-routes are generally less preferred than locally originated-routes. You can redistribute routes from one routing protocol to same routing protocol, like two separate OSPF with different process ID’s. Similarly you can redistribute static routes and connected interfaces into a routing protocol as well. This article is about the redistributing the static routes into EIGRP process. For simplicity and clear understanding I have designed a lab in GNS3. We have three routers R1, R2 and R3. R1 and R3 are running with EIGRP and our objective is to redistribute the static routes from R2 into EIGRP so that these can be available at R3 as external routes. For Static Routes redistribution into EIGRP you need to permit all the static routes with a route map which you want to redistribute into EIGRP. For this you are required a access-list with all IP which are going to redistribute in EIGRP. Network 10.10.10.0, 20.10.10.0, 30.10.10.0 and 40.10.10.0 are the interfaces configured at R1 and after complete configuration you can find these routes in R3 routing table. You can also perform an end to end ping for testing. Following are some other redistribution labs you can visit these as reference and learning.